Every business looks to serve a set of customers in order to maximize profitability and add new customers for further expand their base. All businesses understand that few customers can be more profitable to serve (may be due to repeat purchase and loyalty), remains good prospects for up-selling. Similar is the case for eCommerce companies. Your best customers, spend lot of time on your site, purchase regularly, because they value the offerings and services. They in turn educate and recommend your site, to their friends and families as well as to other users. They offer positive feedback and become unofficial spokesperson (word of mouth marketing). So get good customers and print dollars …easier said than done? So what are the Challenges?? 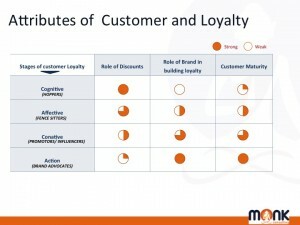 depends on customers’ approach to purchasing online, their perception (refer http://monkconsulting.co.in/is-perception-overrated-in-ecommerce/ ) and their preference for a brand. 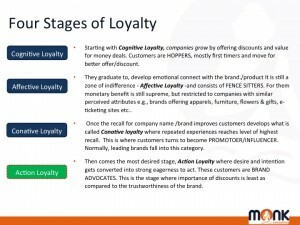 Loyalty is a sum total of various activities from the idea / need for product or service to post sales recommendations and beyond. With deep insights available thanks to technology help and use of Analytics as well as BIG Data, large eCommerce companies have various matrices like frequency, stage, interest, time, demographic insights etc. to make efforts and gain loyalty. 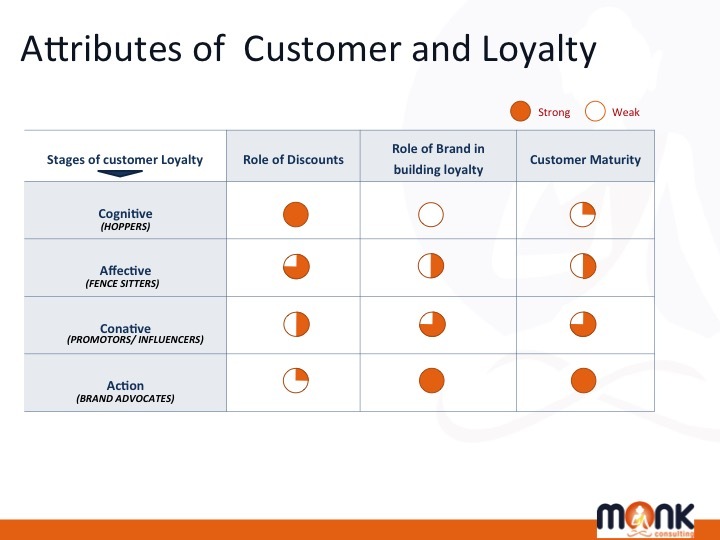 Loyalty is directly proportional to user maturity on e-commerce platform and inversely proportional to importance of discounts for customers. 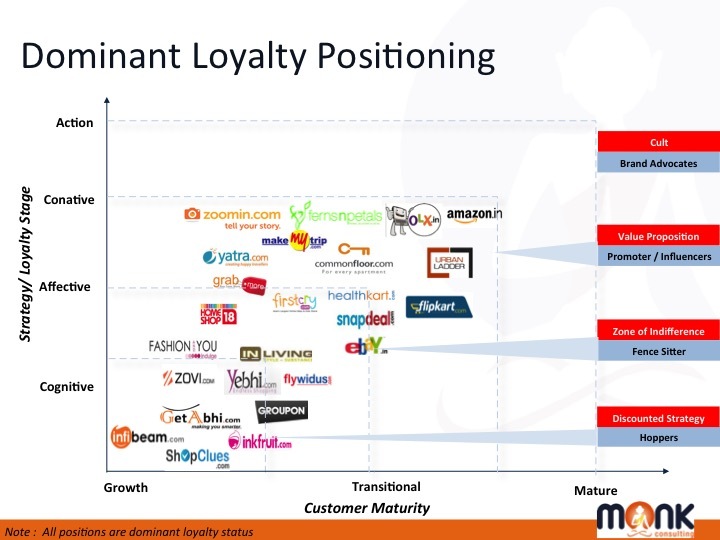 eCommerce companies e.g Flipkart, Snapdeal and Amazon tend to focus on all the stages/level of customer maturity and loyalty. Target cognitive level by offering huge discounts/sales offer on specific days and at the same time try to create value for mature users by introducing exclusive offers/services for them. Some others like Shopclues and Naaptol try to attract customers majorly with discounted prices on their product offerings, which they do not directly promote on television commercials but their website design, look and feel exhibits so. Then there are some brands like HomeShop18 and Rediff Shopping that have evolved into e-commerce brands from their other segments businesses like Television Shopping (HomeShop18) and web browser (rediff.com). These brands generally fall somewhere in a zone of indifference for customers as they do not form top of the mind recall for generic product categories. 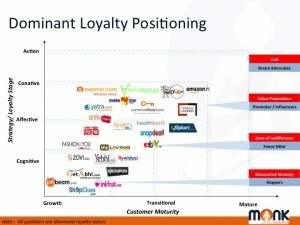 Niche players across categories Apparels (Myntra), furniture (Urban Ladder) etc. focus on value proposition to customer and therefore most of their branding and promotional activities will exhibit variety, quality, convenience, style statement and so on depending on the product category they cater to. Discounts and promotional campaigns happen but the idea here is value proposition. Niche players reach Cognitive level quickly (if there is a positive experience for high value products) or may have a long way to go (for an unsatisfactory experience). 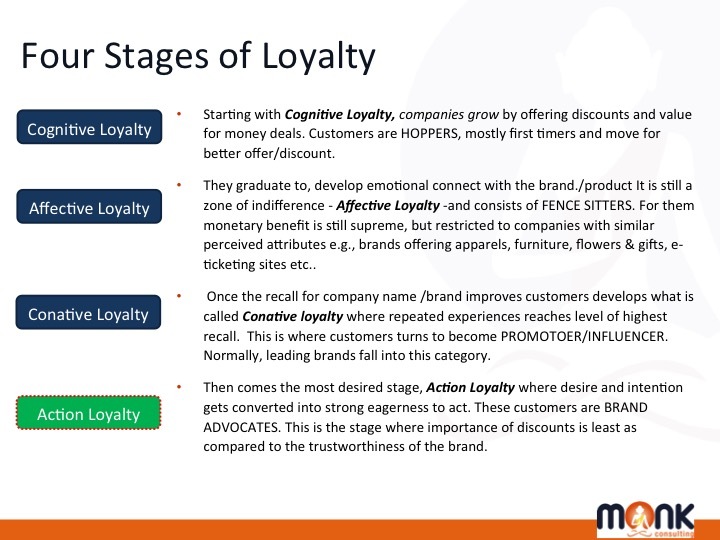 LOYALTY is not like climbing a staircase, in which a customer will go from discount hunter to a loyalist to promoter of brand. Loyalty is a roller coaster and any artificial attempt at building loyalty can boomerang.Spending money and building communities and loyalty program will not buy a company loyalty. SO what should online business do? Its one of the most repeated statement, it costs five time to acquire a new customer than it is to keep an existing customer. If these companies spend time to analyze individual needs using technology and buying behaviour, we can have many more innovations coming out of Indian market for India and global markets. Strategic segmentation is one of the most important activities in building and developing loyalties In a Article published in HBR in 1964, Daniel. Yankelovich first introduced the idea of going beyond demographics as the basis for sorting buyers into groups. He argued, “Once you discover the most useful ways of segmenting a market you have produced the beginnings of sound marketing strategy.” Nearly 40 years later he broaden the use of segmentation so that it could include not just advertising but also product innovation, pricing, choice of distribution channels, and the like. Dr. Michael LeBoeuf Author, Speaker and Thinker.